Second-hand smoke is a mixture of exhaled smoke and smoke that comes from the tip of a burning cigarette, pipe, or cigar. Third-hand smoke is made up of the toxins in smoke that linger even after the smoker puts out the cigarette, cigar, or pipe. Both types are harmful to health, especially for young children. This handout is intended for new parents and their entourage. 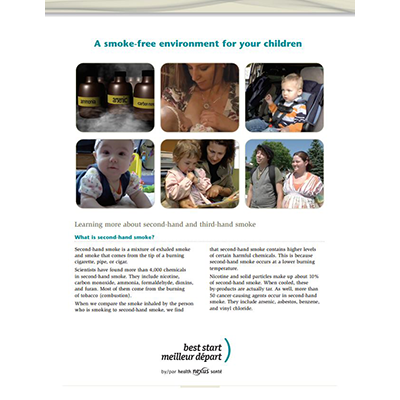 It contains information on second and third-hand smoke, provides a summary of the strategies offered in the video Creating a Smoke-Free Environment for Your Children (available in English and French) and sources of supplementary information.